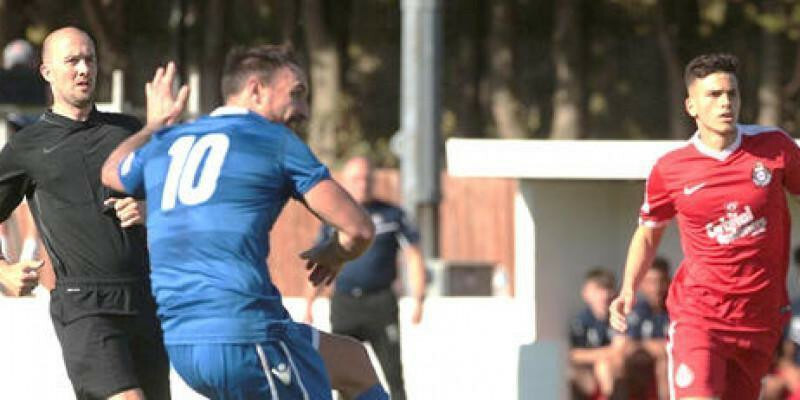 A seven goal thriller at the Webbswood Stadium saw Kings Langley take all three points in the Wiltshire sunshine to move above their hosts in the league table. Supermarine drop into the relegation zone and are yet to taste victory at home in the league this season after another sloppy defensive performance. A defensive mix-up gifted Brad Gray the opener, volleying home from the edge of the box as King’s Langley keeper Charlie Burns made a hash of a clearance before easy finishes from close range by Steve Ward and Callum Adebiyi turned the game on its head before half time as the home side struggled with the physical presence of the Kings Langley attack. Joe Selman won a penalty for the home side much to the dismay of Kings Langley manager Steve Conroy who was sent to the stands before Brad Hooper, who missed his last penalty versus Yate Town coolly slotted the spot kick past Burns. Ward grabbed a second from the spot after being fouled by Dan Williamson, before Renee Howe put the game beyond doubt on 83 minutes after being played through one-on-one against ’Marine stand-in keeper Kev Sawyer. Conor McDonagh curled home an injury time goal, but it was too-little-too-late for Lee Spalding’s men who slipped to another home defeat.